Television shows often follow trends. Over the past few years, you may have noticed a glut of police procedural shows which focus on science and forensic evidence. (Of course, C.S.I. introduced this current trend.) Of these shows, Bones is the one which really caught my attention. Initially this was due to the presence of David Boreanaz, whom I had enjoyed on Angel. After watching the show, I admired the fact that it really clung to the idea of being all about the science. Thus, I was looking forward to the DVD release of Bones: Season Two. (Author's Note: In order to review Bones: Season Two , I must divulge some plot points from both Season One and Season Two, so if you don't want any spoilers, read with caution. -- ML) In the first season of Bones, we were introduced to Dr. Temperance Brennan (Emily Deschanel), whose nickname is "Bones". She is a forensic anthropologist who works for The Jeffersonian Institute. She assists FBI Special Agent Seeley Booth (David Boreanaz) in solving murders where the body isn't easily identified. We learn that Brennan, and her brother, were placed in foster care after the death of their parents. As Season One drew to a close, Brennan was shocked to learn that her father is alive and that her mother was murdered long after Brennan was told that she died. The second season of Bones, opens a few months later. Brennan has spent some time looking for her father. When she returns to The Jeffersonian, she's surprised to learn that she has a new supervisor, Dr. Camille Saroyan (Tamara Taylor). Saroyan is a former New York City coroner and her no-nonsense approach to work clashes with Brennan's scientific and rational style. This wrinkle aside, Brennan gets back into her work with Booth. Meanwhile, romance is in the air. Hodgins (T.J. Thyne), who studies dirt and particles, confesses his attraction to staff artist Angela (Micheala Conlin). While on assignment in Florida, Brennan meets FBI agent Tim Sullivan (Eddie McClintock), and they begin a relationship. During this time, Brennan continues to learn more about her parents and her past. I typically try not to be a hypocrite, but I'm afraid that I'm going to sound like one now. For shows such as The X-Files or Supernatural, I will emphatically state that I find the all-encompassing story arcs to be cumbersome, and that I prefer the stand-alone episodes. But, while watching Bones, I yearn for a story arc or something while will link the episodes. Granted, there are some storylines in Season Two which follow something with a particular character -- specifically the relationships between Hodgins & Angela and Brennan & Sullivan, and, to an extent, Brennan's relationship with her father -- but otherwise the season is made up of 21 individual episodes. For the most part, these episodes are very good. In fact, some are mesmerizing. Bones is a very well-written show which does a great job of blending a traditional murder-mystery with very heavy doses of scientific investigation. The show is very sly with introducing red herrings and making the viewer seek clues right along with the characters. (In fact, one quickly learns to overlook the first obvious suspect, because we know that it has to be someone else.) But, despite the quality of these shows, I couldn't help but yearn for something else. There were at least two times in Season Two where it looked like Brennan and Booth were going to have an ongoing nemesis -- both serial killers -- but one ended quickly and one was never mentioned again. The individual episodes are no worse from the lack of an overriding storyline, but the season as a whole suffers. This make Bones: Season Two a tough call on DVD. Is the show good? Yes, it's a quite good police procedural/murder-mystery, with solid storyline and interesting characters. For those who missed Season Two, or aren't familiar with the show and want to check it out on DVD, it's worth watching. But, this isn't one of those shows which benefits from DVD viewing marathons. This boils down to the fact that there's nothing to make you want to watch the next episode, save for the sheer enjoyment of the show. There are no cliffhangers or other dramatic devices to make one say, "Oh well, I guess I'm not going to bed." When I'm reviewing a DVD boxed set, my wife and I will usually watch as many shows as possible back-to-back. With Bones: Season Two, this felt like a chore at times. Some may accuse me of nitpicking here (in this day and age, one shouldn't quibble over a watchable show) as Bones is a good show. However, I can't help but wonder what it would be like if Brennan and Booth had spent a portion of each episode working on a larger case. 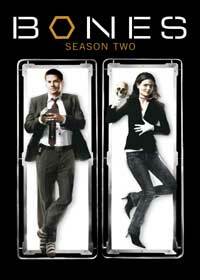 Bones: Season Two uncovers the truth on DVD courtesy of 20th Century Fox Home Entertainment. This boxed set contains all 21 episodes from Season Two spread out over six discs. (We learn that an episode was cut from Season Two which will air in Season Three.) All of the shows are presented in their original 1.78:1 aspect ratio. The images in this transfer look good, as the picture is sharp and clear. We get essentially no grain and no defects from the source material. The clarity of the image lends the picture a nice amount of depth. The colors look fine, as the show blends natural colors with the sharp, metallic look of the lab. I noted some mild video noise, but otherwise the transfer was fine. The shows feature a Dolby Digital 5.1 audio track which provides clear dialogue and sound effects. The stereo effects are good (and well-placed), but the surround sound effects, are too subtle, as they are really only noticeable during crowd scenes or action scenes. The Bones: Season Two set is rather light on extras. The episode "The Glowing Bones in the Old Stone House" (Disc 5) features an AUDIO COMMENTARY from star Emily Deschanel, director Caleb Deschanel, and executive producer Stephen Nathan. (Please don't be fooled by Emily's comment at the opening, Caleb is her father.) This is a pretty-good talk as the trio discusses the making of the episode, with an emphasis on Emily's performance. "Stargazer in a Puddle" (Disc 6) has a commentary by Nathan along with series creator Hart Hanson and executive producer Barry Josephson. Again, this is an average talk as they discuss the making of the season finale and talk about some of the themes from the season. The remainder of the extras are also found in Disc 6. The cast and crew reflect on the stories and characters of Season Two in "The Memories in the Season" (16 minutes). "Visceral Effects: The Digital Illusions of Bones" (13 minutes) explores the CG effects used on the show, some of which are quite seamless. The DVD features 9 DELETED SCENES, with optional commentary by Hanson and Nathan, which run about 8 minutes. All of these scenes are brief and don't have any groundbreaking material. Finally, we have an 8-minute GAG REEL.